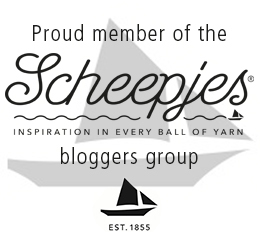 Deramores has asked me to be part of their Deramores Blog Competition 2015, which is open to all crochet (and knitting) bloggers worldwide! 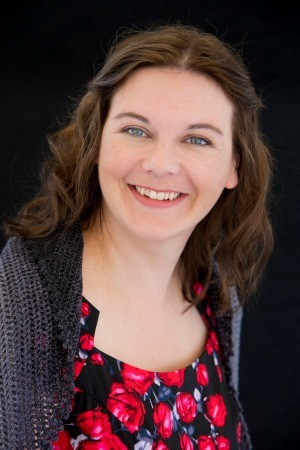 Along with 5 other bloggers, I have been asked to predict a trend for 2015. Bloggers around the globe are then invited to put their own spin on the trend and blog about it. By submitting your spin on any of the 6 predicted trends (or all of them), you stand a chance to win a year’s supply of yarn (worth £500)! Five runners up will also win a bundle worth £50. You can find all the details for the competition (including other participating bloggers and rules) HERE. But don’t go before you have read all about my predicted trend! Unsurprisingly, I have chosen Large Crochet Squares (and a kazillion colours) as my predicted crochet trend. Of course this does not exclude knitters. If you think that you can come up with a crazy gorgeous large knitted square (or motif), be my guest! 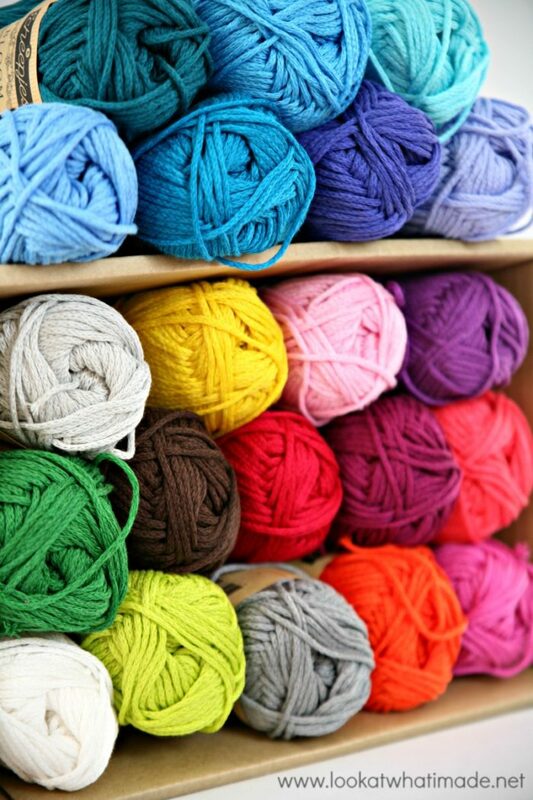 And feel free to substitute the word “crochet” with the word “knit” everywhere in this post. 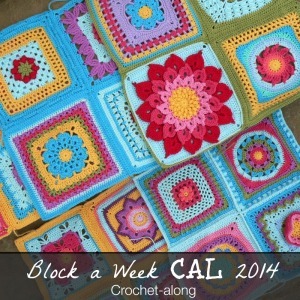 Crochet squares have always been popular, from the basic granny square up to the most intricate of squares. They have also been small. 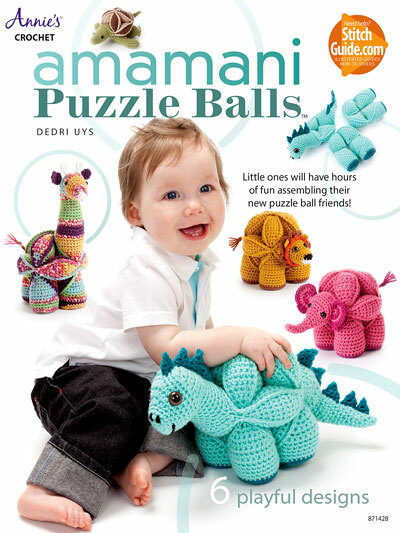 Lately, though, there has been a surge in the number of large crochet squares being designed. I’m not talking 14 inches. I’m talking 20 inches and upward. 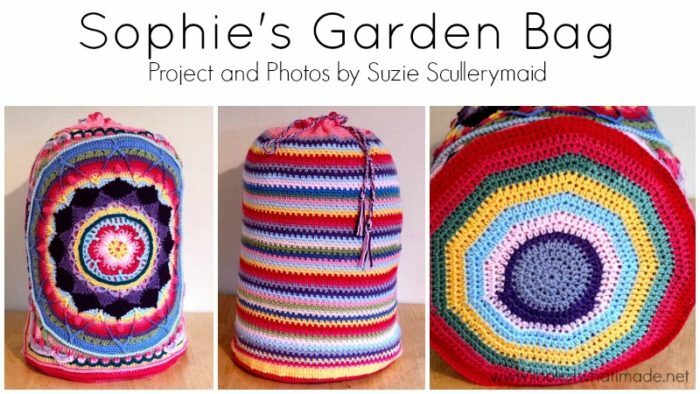 These squares usually start off with a mandala (circle) which then gets “squared off” (like…cue massive plug…Sophie’s Garden). 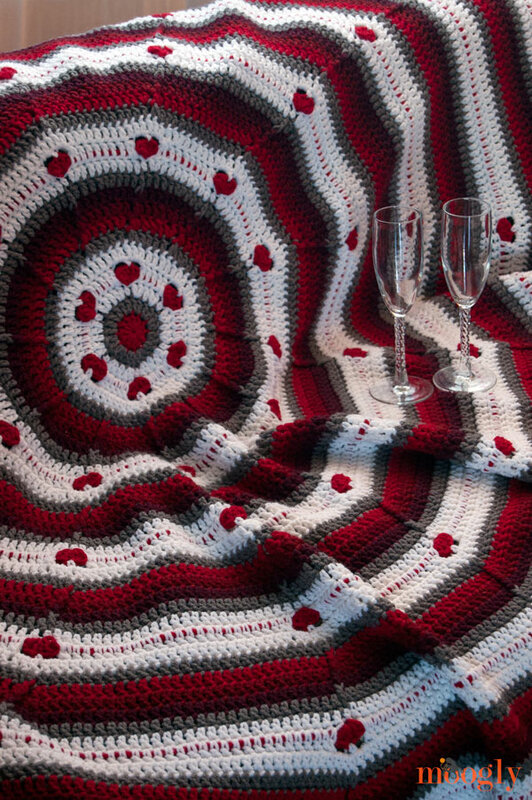 Large crochet squares like this offer an infinite variety of possibilities and it is my prediction that they will become very popular indeed. 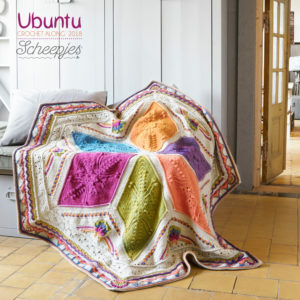 Not only are they magnificent and striking, but you also end up having to sew fewer squares together should you decide to use them for an afghan. 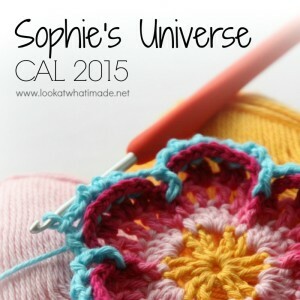 They also lend themselves really well to being “grown” in the round, very much like what I am doing with the Sophie’s Universe CAL 2015 (now on Part 11 of 20). Due to the huge range of photo and video tutorials available online I feel that beginners will no longer limit themselves to scarves and dishcloths, but will be inspired to tackle large intricate patterns like these with confidence. 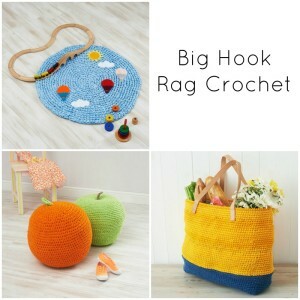 I also think we will see more colourful pieces being produced as people continue to explore crochet as an art-form. Yes. I said it. Art! I want to encourage you to use lots of colours in your “submission”. You don’t have to use all the colours of the rainbow, but be experimental in your use of colours. I have included a photo of my stash of Scheepjeswol Bloom to whet your appetite. You can always use monochrome colours if that is what you are comfortable with (see the top selection in the photo below), but I want to encourage you to push your boundaries by using complementary/contrasting colours instead (bottom selection in the photo below). 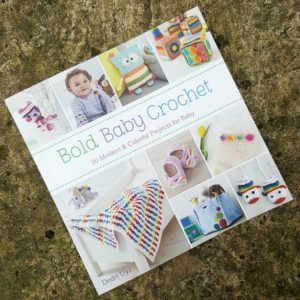 I would like to challenge my fellow bloggers to come up with a design for a large crochet square, or to grow/incorporate an existing square into an article (be it vest, bag, blanket, or top-hat). And the more unique your colours, the better! 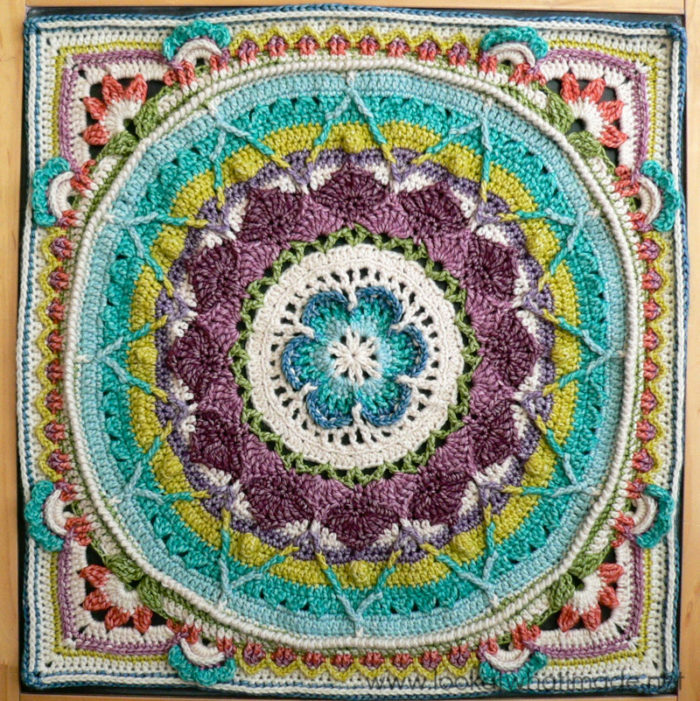 Marja Heilig van Westen has made this awesome square by planting Attic24’s Blooming Flower Cushion in Sophie’s Garden. 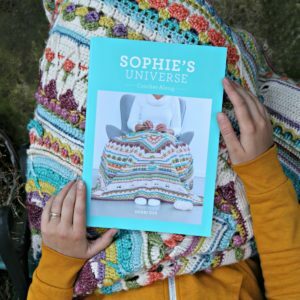 You can square any circular project up using Part 4 of Sophie’s Universe, provided that your circle has a final-round stitch count of 240 st’s. 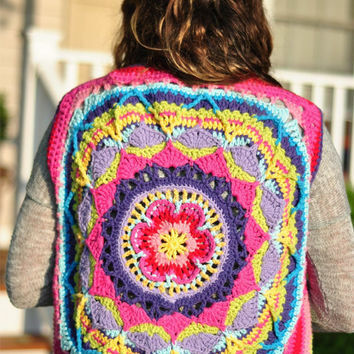 For instance, I would love to turn Moogly’s Circle of Love Afghan into a square by making the first 21 rounds and then squaring it up with Part 4 of Sophie’s Universe. I would also love to see John P Kelly turn his Mandala 21 into a square. I used his pattern to make a rug, but I think it would look amazing as a multi-coloured afghan square. Once you have made your square, you can turn it into a vest, like THIS VEST by The Edge of 17 (available to buy on Wanelo). Or what about a bag like this one by Suzie Scullerymaid? 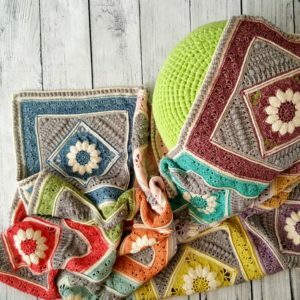 To get your creative juices flowing, I have included a few links to some gorgeous designs (either stand-alone large squares, or designs featuring large crochet squares). I am so excited to see what you come up with! Remember to see THIS POST for all the details. And while I am telling you to remember stuff, remember to subscribe to my Weekly Newsletter if you would like to be kept in the loop. 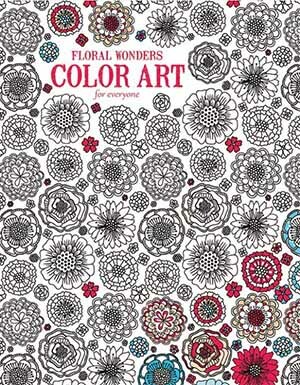 You can also like my Facebook Page or follow me on Bloglovin, Google+, Pinterest, Twitter, or Instagram. Love all of these examples. Crocheting some Easter things right now as soon as I am finished i am going to start A large motif afghan for my brother and SIL for their anniversary. Oooo!! So exciting! So many ideas! Love this competition! These are lovely. 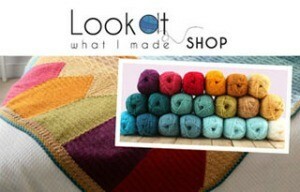 I love the colours and variation in patterns and stitches. Totally agree about the bonus of there being less to sew together at the end. One of my worst projects became a cushion cover as I could not bear the interminable squaring off of tiny circles and their larger cousins THEN having to sew it all the tiny squares and link them to the larger etc It became a chore rather than a pleasure. 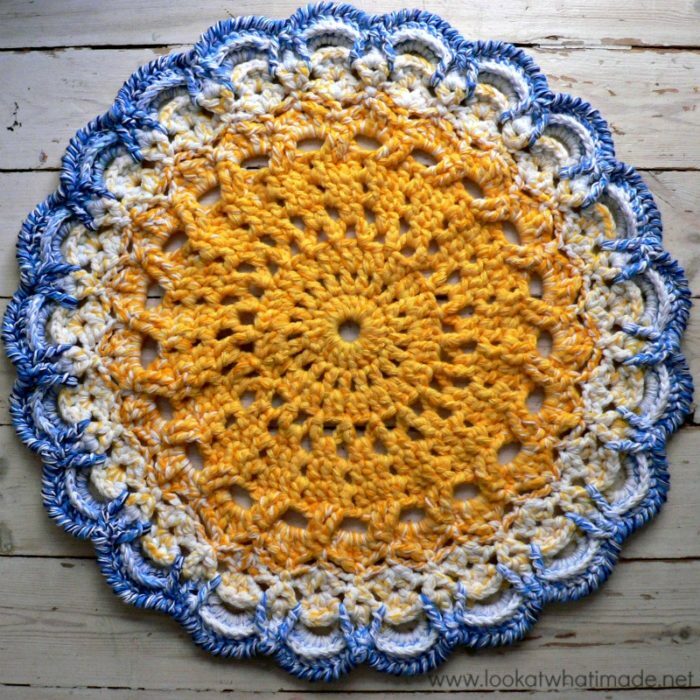 The large mandala centred squares has an element of challenge as well as allowing you to see progress rather than a pile of disconnected tiny bits collecting in the craft basket. I can definitely see this as a trend I’d follow. Glad to hear that :) I look forward to seeing if you do decide to blog about one of the trends!